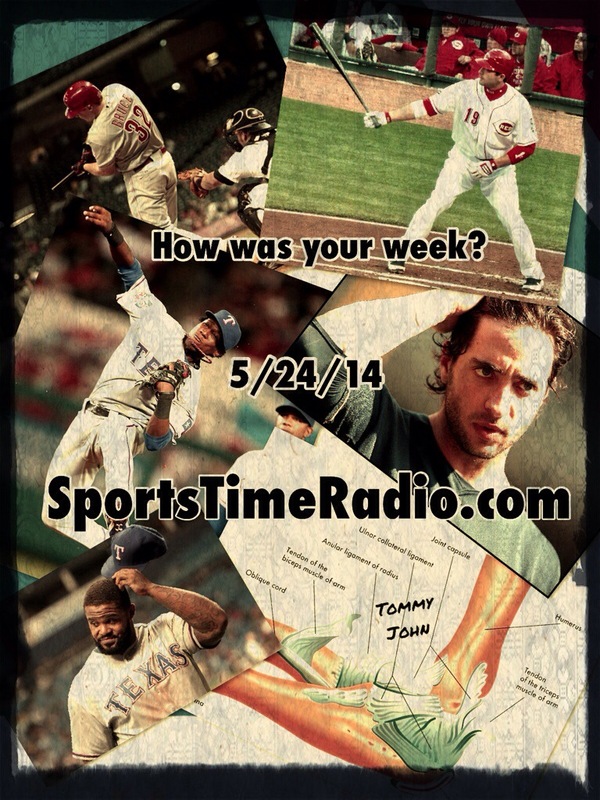 5/24/14 How was your Week? I think that the NHL playoffs have been pretty exciting this season. The problem I’m having now is the scheduling with the Western conference finals. For some reason they went away from the every other day format and now seem to be working with two days off in between games. In a way I guess it’s good for the teams as players get an extra day of rest, but this will stretch out the playoffs until June. By the time the Stanley Cup finals rolls around I’m not going to care who wins the cup. Now that would be sad because like I said the playoffs have been exciting. The Blackhawks/Kings series is tied at 1 game apiece with the series headed back to Los Angeles for Game 3 tonight. The New York Rangers have a 2 games to 1 lead over the Montreal Canadians in the Eastern conference finals with Game 4 tomorrow in New York. In the Rangers/Canadians series the home team hasn’t been able to win a game in the series. The NBA playoff scheduling is just as bad if not worse than the NHL’s. The Miami Heat and the Indiana Pacers played Game 2 of their series Tuesday night. Then the teams were given three days off to travel to Miami for Game 3 tonight. The series is tied at 1 – 1 and the extra rest might help the Pacers more. Paul George got hit in the back of the head by Dwayne Wade in Game 2 and suffered a concussion. Now with the extra rest George has been cleared to play tonight. Even with George playing the Pacers will have a tough time beating the Heat. In the Western conference finals the San Antonio Spurs have looked like the best team in the playoffs. They have a 2 – 0 lead in their series against the Oklahoma City Thunder. I think everyone thought the loss of Serge Ibaka would be a big issue and the Spurs have taken advantage of this situation. There’s been some reports that Ibaka will be available to play in Game 3 tomorrow. If Ibaka isn’t completely healthy I don’t think he’ll be able to help the Thunder, but just his presence might make a little difference on the mental side for the Thunder. The Spurs/Thunder series resumes Sunday with Game 3 in Oklahoma City. If you’re a fantasy baseball player injuries are a big concern for you right now. Of course I guess the injuries would be a big concern for major league baseball teams as well. Off the top of my head there where some big name players that ended up on the disabled list (DL) this week. The Cincinnati reds got Jay Bruce back from knee surgery, but Joey Votto went on the DL the day Bruce came off the list. Ryan Braun is on the DL for the 2nd time this season. The Brewers played okay with Braun out the first time, but you can only be without your best player for so long. Prince Fielder went on the DL for the Texas Rangers with season ending surgery on his neck. Fielder has been bothered by a herniated disc in his neck and has opted for surgery to correct the problem. Then just to add to the Rangers injury issues top prospect and projected starting 2nd baseman for this season Jurickson Profar had a set back in his injury rehab and the reports are saying he’ll be out 10 – 12 more weeks. Profar hasn’t even had an at bat this season. Those are just some of the injuries I thought of off the top of my head and I didn’t even get into the injuries pitchers have suffered this season. Just going over the list of pitchers who need Tommy John surgery this season is a long one. Dan the Man, Mr. Fantasy and I are in a couple of large fantasy baseball leagues. One league has 18 teams and the other has 20 teams; this makes injuries tough to deal with. You can’t go out and pick up a star player on the waiver wire when one of your top guys gets injured. To me it makes the leagues fun to play in, but it also will drive a lot of fantasy players away. A lot of fantasy players want the easy smaller leagues to play in where if you lose a player or a guy is having a bad year you just drop him and there’s an all-star out there on waivers waiting for you to pick him up. Dan the Man has told the story on air before where two people he knew got in our 20 team fantasy football league a couple of seasons ago. These guys ended up meeting in the leagues Super Bowl that season. Then the next year neither of them came back to play in the league because 20 teams was too hard and they where looking for easier leagues to play in. This is the first time ever that I’ve been in any type of fantasy league where the top two teams didn’t return the next season. I guess it’s to each his own when it comes to fantasy sports.